To spare every precious minute in the morning, I prepare as much as possible the night before. I begin by washing and drying the spinach, tomatoes and lemon. I was taught by my wonderful home economics teacher, Mrs. Pfromm, to always wash the outside of all of my fruits before storing them in the refrigerator. I do this for citrus and apples but not berries. I only wash berries before I use them, otherwise the moisture will cause them to spoil faster. Slice the tomatoes and lemon, then place them, along with the spinach, in a sealed plastic or glass container. Refrigerate overnight. In a small glass bowl, add smashed and rough chopped garlic with 1 tablespoon of olive oil. Cover with plastic wrap and refrigerate overnight. Add 1 tablespoon of olive oil to the frying pan over medium heat. Smash, then rough chop the garlic before adding it to the warm oil. Sauté the garlic for about 1 minute until fragrant. Add the spinach and tomatoes to the garlic and olive oil. Toss together until the spinach starts to wilt. Season with salt and pepper, then move the spinach, tomatoes and garlic to one side of the pan. On the empty half of the pan, add the remaining 1 tablespoon of olive oil. Fry the eggs on that side of the pan. Then cover the eggs and spinach. The egg only needs 1 or 2 minutes to cook when covered. The eggs can be prepared sunny side up, over easy or you can even poach the eggs in a separate pot. 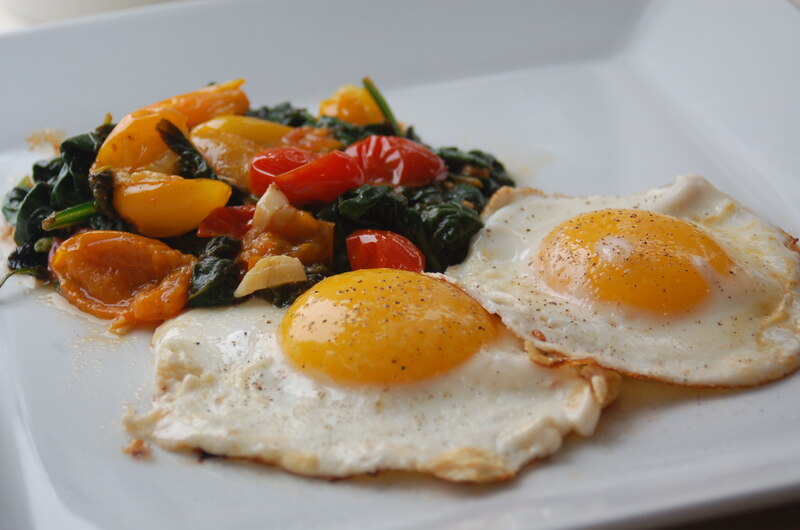 Just before removing the eggs, squeeze 1/2 of a lemon over the spinach and tomatoes. 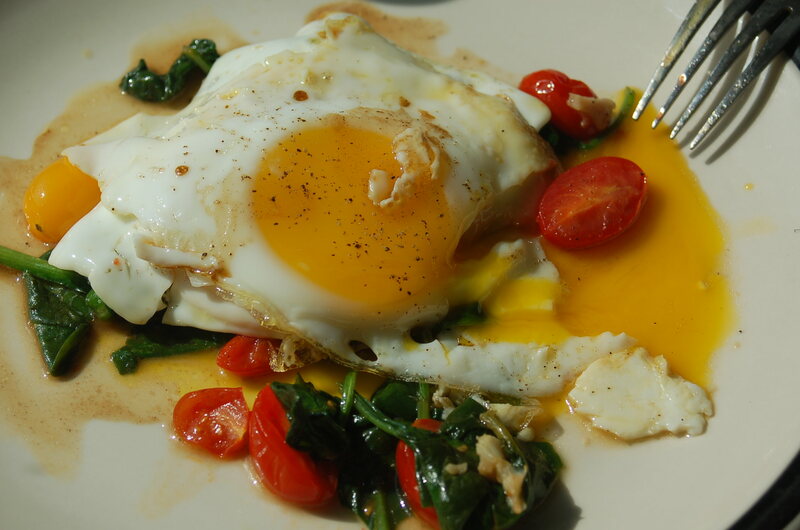 Serve the eggs either to the side or over a bed of spinach and tomatoes. I like to add a couple dashes of Worcestershire sauce to the top of the eggs. I learned this from my parents growing up and have always eaten my fried eggs with Worcestershire sauce. Give it a try. It’s delicious.